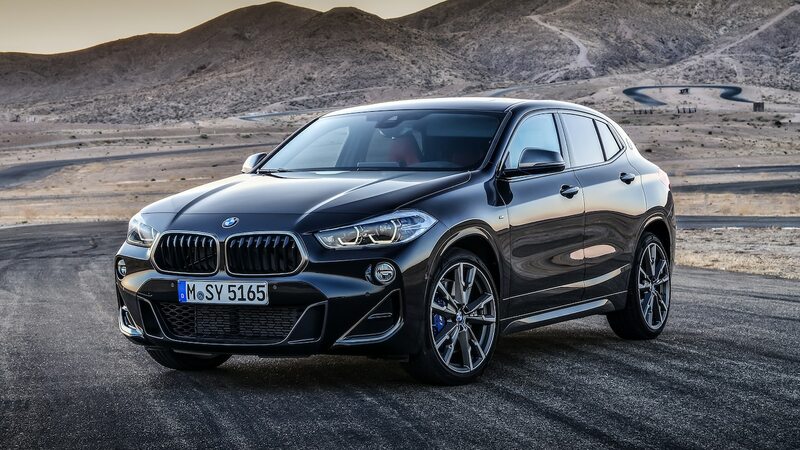 BMW introduced the X2 for small crossover customers that want a bit more style than the X1 can offer, and now it’s introducing the M35i version for those who want more power and sportier handling to go with their extra style. The 2019 BMW X2 M35i packs the most powerful version of BMW’s 2.0-liter turbo-four yet, rated at 302 hp and 332 lb-ft of torque. Those numbers represent a jump of 74 hp and 74 lb-ft from the X2 xDrive28i. The X2 M35i’s engine even tops rear-drive applications of the turbo 2.0-liter, where it makes 248 hp and 258 lb-ft in vehicles like the 3 Series and X3. To achieve the higher output, BMW’s M division revised every major engine component. The X2 M35i gets a reinforced crankshaft with larger main bearings and new pistons with a lower 9.5:1 compression ratio. This allows the engine to take more boost pressure from a larger turbocharger, which blows compressed air through an intake tract that’s been reworked for better airflow. The X2 was already available with M Sport adjustable dampers, but the M35i comes with a standard M Sport Suspension tuned specifically for the M variant. The suspension offers stiffer spring and damper rates, and like the optional kit for the xDrive28i, it lowers ride height by 0.4 inch. Meanwhile, the rear control arms and axle carrier have been redesigned. But the aforementioned M Sport Differential is perhaps the crossover’s biggest handling improvement. The transaxle-integrated unit can lock up to prevent losing traction at the front wheels. Lastly, the M-tuned steering offers a quicker ratio and is said to deliver better steering feel, and the M35i gets M-specific brakes. The X2 M35i gets a unique front bumper with larger intake openings finished in Cerium Grey. That special color is also used on the dual kidney grille frames, mirror caps, and other exterior parts. In back, you’ll find a roof-mounted M rear spoiler and an M Sport exhaust with dual 100mm tailpipes. The crossover rides on 19-inch Orbit Grey two-tone alloy wheels as standard, but 20-inch M Sport alloy wheels with Cerium Grey accents are available. Inside, the M35i gets all the goodies from the M Sport package, including sports seats and a leather-wrapped M Sport steering wheel with shift paddles. Buyers can choose the optional M sports seats upholstered in Magma Red or black perforated Dakota leather. Just like the standard X2, the M35i can be optioned with BMW’s full-color head-up display and Apple CarPlay. Fun fact: the X2 is one of only a handful of vehicles that can run CarPlay apps wirelessly off your iPhone.